Home » Greenroom » Smashing Desserts…to Smithereens! Each month we spotlight new or exciting Australian businesses which have either subscribed to Greenroom or are Alsco customers. We want to know what makes your business tick and how this can help other Alsco customers to create a greener, safer and healthier businesses. Today’s spotlight is on The Covenant. The Covenant uses Alsco’s linen laundering service, which is of vital importance for product delivery, napkins, table clothes and runners. Table linens set the image and mood of the restaurant. This welcomes your guests in their dining table. To make sure your table linens are ‘always’ crisp, clean and sanitised, avail hassle-free and fully-managed linen rentals, like the ones from Alsco. The Covenant serves a higher end dining experience of Modern Australian Cuisine in internal dining and also a relaxed water’s edge ‘deck’ menu, coupled with Cabana booths sitting on the water’s edge. 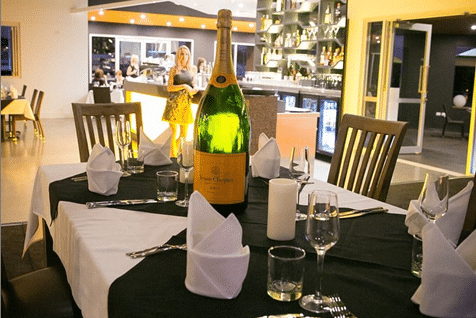 We have a close partnership with Verve Clicquot that makes us able to serve Verve Cliquot by the flute and be involved in the activations of the Clicquot product. The Covenant aims to provide an experience that differs from a dining experience to more of a lifestyle choice. Located on the prime waterfront district in the heart of Sanctuary Cove, our product delivery and quality of experience is what we aim to keep to the highest standard. Find out more about The Covenant and their awesome story through these interview questions. 1. What is The Covenant most famous for and why? Whilst The Covenant is still a new business, we had approval from Verve Clicquot to use their brand in conjunction with ours, as such we have a VERY large Veuve Clicquot wall and our Fluer ‘de ‘Vin machine allows us to preserve the champagne after opened which allows us to be able to serve by the flute. 2. 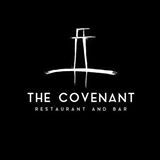 What sparked the idea for you to name your restaurant/bar ‘The Covenant’? The word covenant is associated with an agreement or pact. The idea of The Covenant is to have that pact, of product delivery, we do not freeze our food, it is delivered fresh, daily. Our pact is to ensure that the experience our customer has is a positive experience. 3. If you’re at work (in The Covenant), where can we find you? And what do you do? When I am at work, I tend to be moving through carrying out administrative duties and additionally getting to know my customers. Rhenay, our Restaurant Manager, is always moving through the restaurant and ensuring quality control. Partnerships with major brands is, without a doubt, a highly effective way to get market exposure, similar to the ideology of the ‘One World’ and ‘Star Alliance’ the airlines practice. 5. Do you have a funny story to share about one of your experiences in the business? We do a degustation dessert for our customers and there is a theatrical side to the presentation. A glass plate is laid on the table and the desserts are individually prepared in front of the customer. It looks beautiful. Then at the end, the final dish being set up is a candied bowl with pistachio fairy floss and as our chef moves into place it down on to the artwork of dessert he pretends to trip and drops the first basket onto the plate, it smashes and the look on everyone’s face is priceless! Then they find out it is part of the show as the other 4 baskets get dropped and smashed on to the plate to make the candied baskets in to bite size pieces!! 6. What sustainability practices do you do in The Covenant? And how do you think these can help the environment? We like to reduce wastage. As we get our food in fresh daily, and we don’t freeze, a process of specials and batching allows us to best try and mitigate good food wastage. A ‘disposable’ philosophy across the board can not be sustainable with increased population growth, we do our part by using what we have, and not throwing away good food. 7. If you are to meet the Alsco’s top manager, how would you greet him? What would you say? If I were to meet the top manager, I would greet him very sincerely, as, the business is reflective of it’s managers and product delivery. Alsco does get it right, and well, overtime for me. I would convey that message, sit down with a wine and get some tips! The Covenant Restaurant and Bar is located in The Marine Village, Sanctuary Cove. Their Modern Australian Cuisine Restaurant started in the year 2015. To get their mouthwatering menus and dining options, visit www.thecovenant.com.au. Are you starting up your own restaurant and needs clean, crisp table linens and wipes? Or does your restaurant keeps on growing and you need a hassle-free linen services to help you? Partner with Alsco. With a variety of fully-managed rental services, we ensure your organisation maintains a cleaner, safer workplace, all the time! Call 1300 659 892 for a free quote.